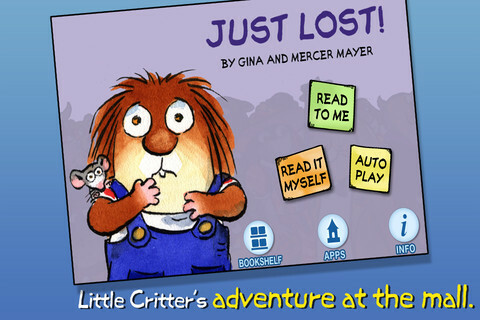 Oceanhouse Media has published yet another Little Critter omBook called Just Lost! For those unfamiliar, Little Critter is a series of stories written by Mercer Mayer about Little Critter’s childhood. Little Critter is a hamster character who is full of imagination, love, and of course mischief! Little Critter is a great series as children can easily identify with his adventures and emotions and also helps teachers, parents, and kids themselves be aware of emotions and how to deal with those situations. In Just Lost!, Mom takes Little Critter, Little Sister, and Baby Brother to the crowded mall to go shopping. Little Critter decides to get down and tie his shoe and winds up getting lost. It’s too noisy for Mom to hear his screams, so Little Critter winds up in a toy store speaking to the toy clerk. The clerk winds up calling security, who takes him away and gives him food and a drink. The security guard calls for his mom on the loud speaker, and they wind up back together. But honestly this story requires more discussion and explanation throughout. I was quite surprised Mom didn’t retrace her footsteps and go back before panicking. So that was a big talk about what to do if separation was to happen. Stranger Danger was also a big discussion with my child during this book, because in today’s society, even people dressed in uniform may not be who they seem. So Little Critter accepting food from a stranger was not a smart move either. 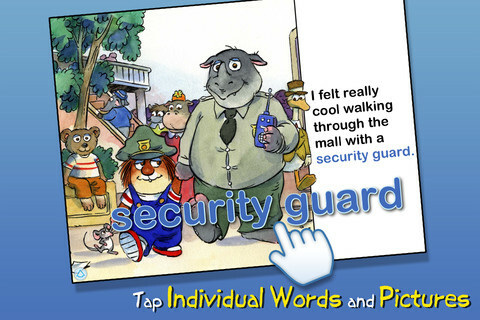 Again, these Little Critter books, in my opinion, need to be backed up with discussion and related to today’s society, rather than a child/student sitting there and listening to the story. A cute mini-game is found within the app where you find mice throughout the story. At the end of the book, the story calculates the total number of mice the reader found within the book. Oceanhouse Media does a great job at combining the original text and artwork of Mercer Mayer, yet providing extras, such as touching a picture to hear and see what that picture is of. You also can replay an entire paragraph if interested. 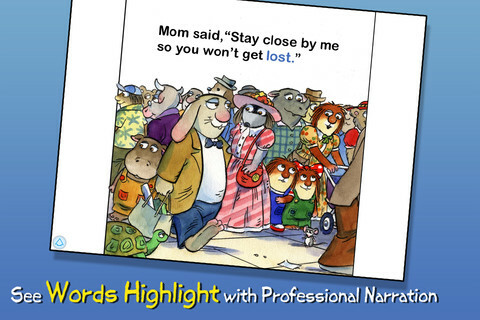 The highlighted words feature is great for early readers. Little Critter has a quite an adventure at the mall when he gets separated from his mom! He bravely keeps calm, asks for help from a security guard and is soon reunited with his lost mother. Young children will be reassured by the happy ending and learn what they can do in a similar situation.